Habitat: It grows on conifer logs, especially those of fir and hemlock. Hericium abietis is the most commonly encountered hericium in the PNW. 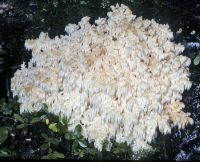 The branches and spines are whitish when young, and become yellowish in age. Three other hericiums are known from North America---H. americanum Ginns occurs on hardwoods (rarely on conifers) in the East, H. coralloides (= H. ramosum) occurs on hardwoods throughout the continent, and H. erinaceus (lion’s mane) occurs on hardwoods in the East and extends into California and perhaps up the Pacific Coast on oaks. The former two are difficult to distinguish from H. abietis by morphology; the latter differs from the others in being unbranched and having longer (up to 5 cm (2 in.)) spines. All are edible, good, and eagerly sought by mycophagists. 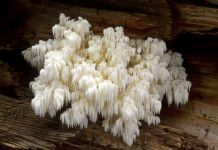 PNW Herbaria: Specimen records of Hericium abietis in the Consortium of Pacific Northwest Herbaria database.